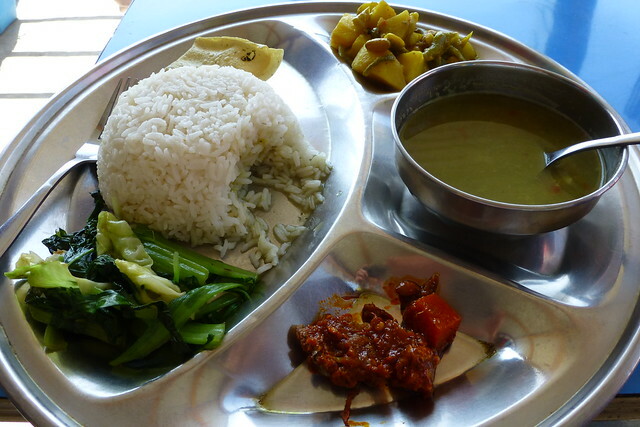 My pre-requisite for a successful holiday is the food interest, so when my sister asked if I would like to join her on a trek to Annapurna Base camp I jumped at it, knowing that Nepalese food would be interesting and vegetarian friendly. The higher Annapurna trek is through Hindu sacred ground so no animals or animal products such as eggs can be eaten, which meant that all the Tea Houses were strictly vegetarian, that suited me! Nepal is one of the poorest countries in the World and its largest in value food export is cardamom. Nepal earns much of its foreign currency from tourists, mostly trekkers like us. I was humbled by how generous everyone was and was lucky enough at the end of the trek to cook with our guides wife Sharmila who showed me how to cook dhal bhat. Annapurna is the goddess of prosperity whose name literally translates into anna (grain) and purna (prosperity) signally the importance of rice as the centre of the Nepalese meal and as an offering to the Gods. 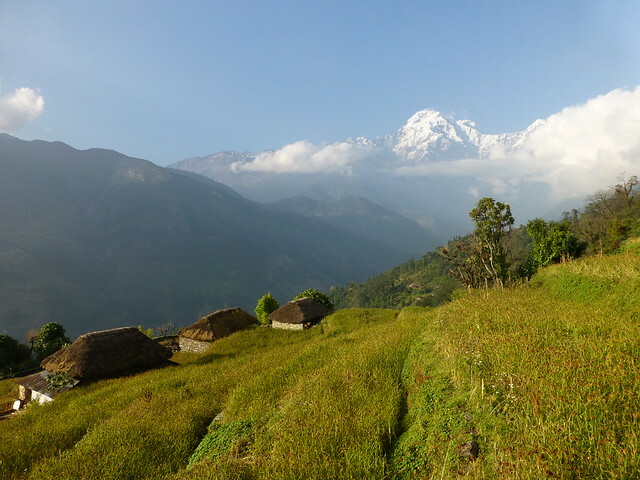 Dhal (lentils), Bhat (rice) and Tarkari (vegetables ) are Nepalese staples in the Annapurna Mountain region and are eaten twice a day at home and in the Tea houses. My sister thought I was peculiar as I was just as keen to photograph our twice-daily Dhal Bhat as I was to photograph the majestic snowy peaks. In the tea houses on the trekking routes Dhal Bhat is served to the local guides and porters, so for an authentic taste it’s the dish to choose (they also happily cooked noodles for the Chinese and pizzas and pasta for the Europeans). Each and every Dhal Bhat we ate was different, depending on the available vegetables. On the lower elevations, cabbages, cauliflowers, greens, potatoes, onions, garlic, beans, gourds, mooli radishes were typical. As we got higher, green vegetables became fewer, with potatoes taking their place. The vegetables are grown in the local terraced fields, and then carried up to the higher tea houses by porters as the paths and stone steps are too steep and too high altitude for the mules. The Dhal is made with a mix of split lentils, black urid being popular and then flavoured with turmeric, cumin and coriander and sometimes spinach added to the mix. 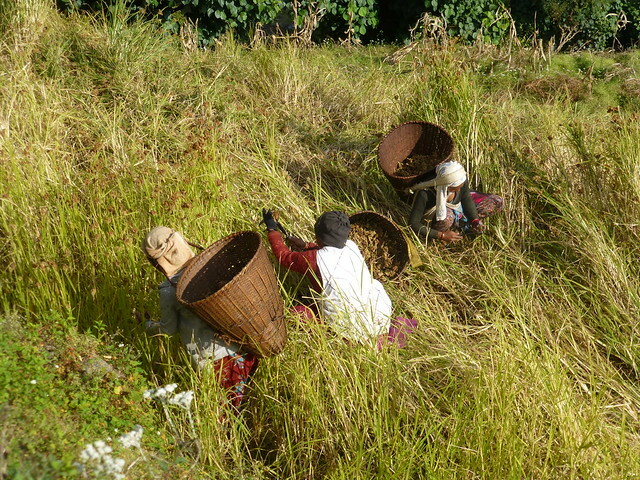 Millet, hardier than rice, grows at high elevations and was being harvested in November by the local Garung villagers. 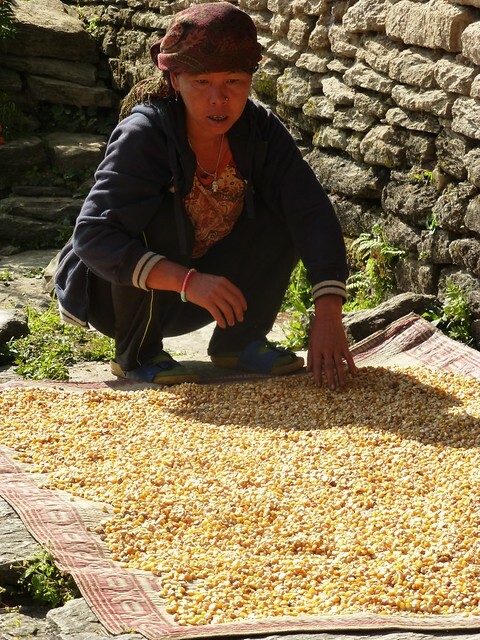 Millet seeds are fermented and made into the local super strong alcohol, Chhaang and drunk warm (through a straw!) or ground into flour to make the staple Dhido which is millet flour mixed with water and cooked into a solid paste, that is eaten instead of rice. Rice is far preferred and is always white plain steamed rice, locally grown on the lower elevations around Pokara. The vegetables vary, with potatoes as the main component, grown in the fields after the millet and rice is harvested and seasoned with onion, garlic, fenugreek, turmeric, chilli, cumin and coriander and they do like their salt! On the side there was always stir fried greens such as mustard tops, spinach and cabbage, and pickles (mooli sliced, much like the Korean kimchi). 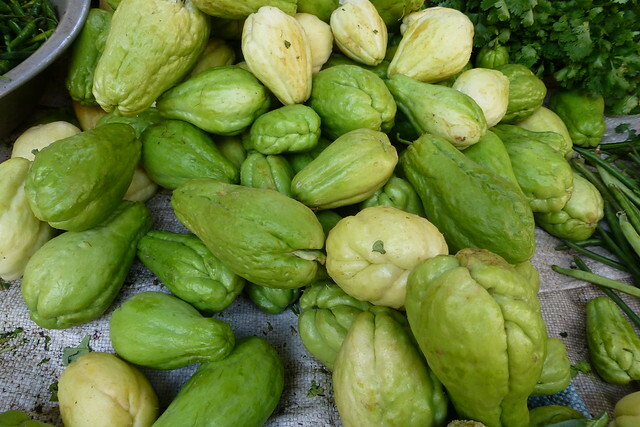 Along the path, Chayote was grown on sprawling vines and have the texture of a crisp apple and a flavour of a sharp marrow. We ate freshly picked chayote sliced and cooked with potatoes and spices. To cook with chayote, peel and then wash well as under the skin, there is a sticky substance that can irritate your skin. The farmers were all preparing for winter and drying and storing produce. 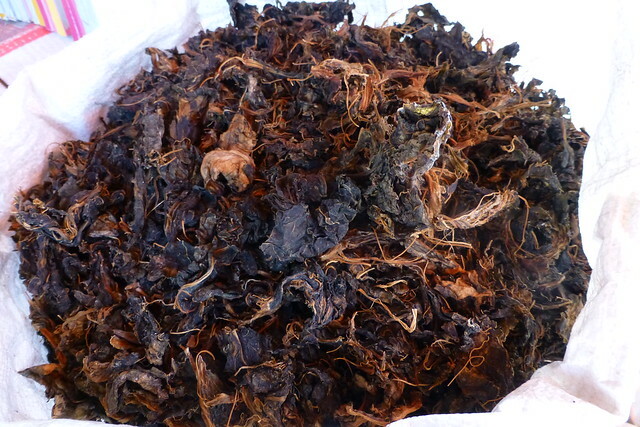 One process that fascinated me and did taste surprisingly good was spinach, dried then fermented and pickled to make Gundruck, which is eaten throughout the winter, when there is no fresh vegetables. Gundruck is either eaten as a condiment or added to soup. With every dhal we were always served a pickle made from Amla which are Indian gooseberries, they are sour like lemon and high in Vitamin C. On my return I found them in the Bristol Sweetmart. As well as a pickle there was a bitter condiment made with bitter gourds, deep fried till crisp, which I enjoyed more than my sister. Sometimes black chickpeas and beans were deep fried for a crunchy addition. 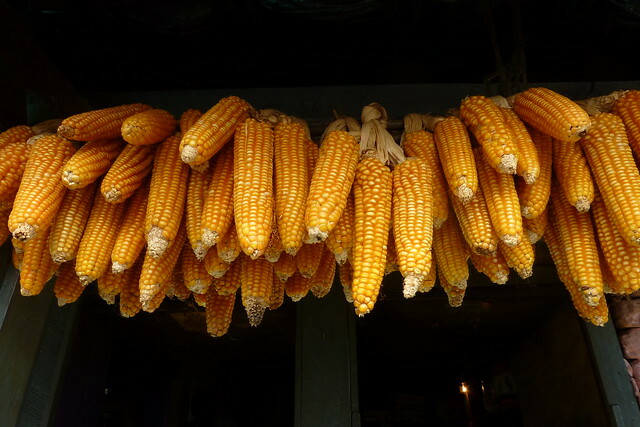 Sweetcorn is dried and made into cornmeal in small watermills for making Garung bread and also "popped" as a snack. We drank Masala tea made with sweetened milk and spices. Up in the mountains where there isn’t a supply of fresh milk we drank black tea flavoured with grated fresh ginger and avoided the local Chhaang as alcohol and high altitude don't mix. With 6 hours walking a day and an almost totally vegan diet for 12 days and masses of fresh mountain air, we both felt wonderfully fit and energised. Would love to go back! for now I'm re-creating the recipes for a Nepalese evening course for February 2015. 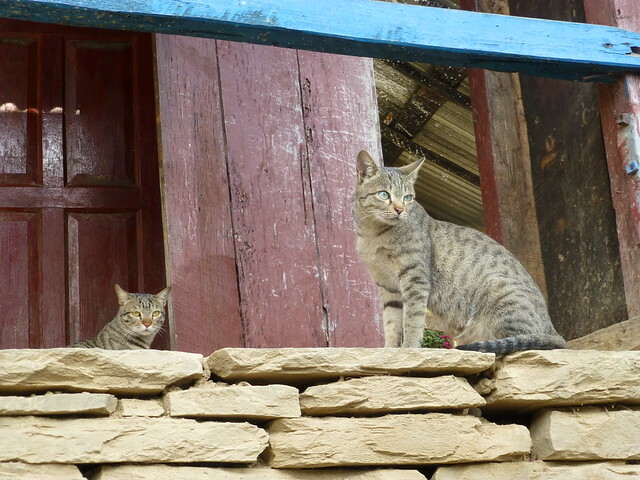 There are lots more pictures from my trek in Nepal on Flickr. 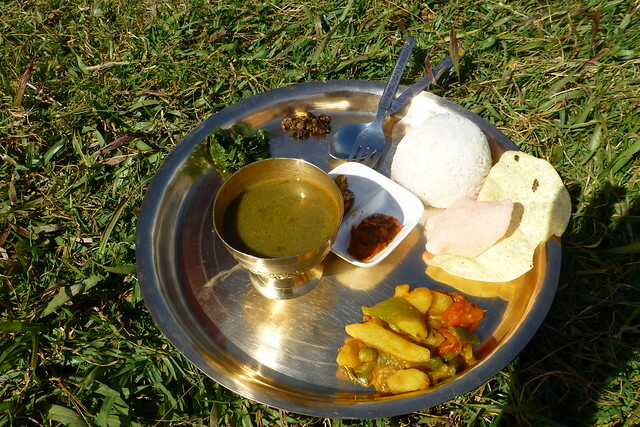 I am very interested to come on your Nepalese cooking course in February. Do let me know the date(s) once they are confirmed. Thank you for such a wonderful blog post! So informative and inspiring. I would love to know when the Nepalese evening course is please? 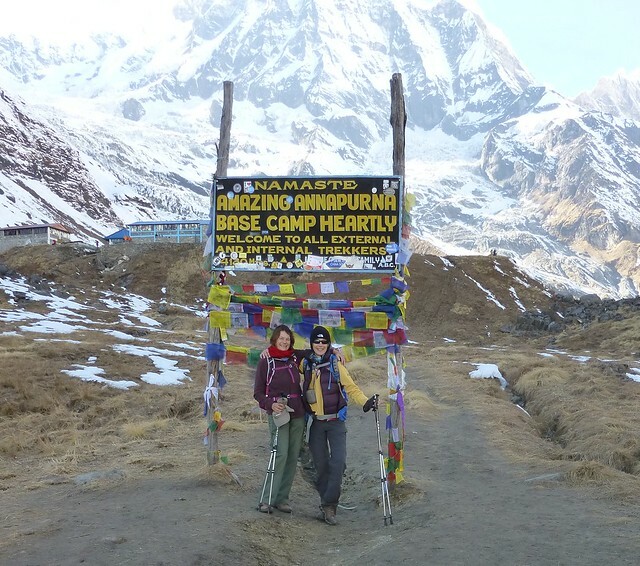 Also are you able to share how or who arranged the trek to Annapurna Base camp? As it sounds like a fantastic experience which I would be really interested in pursuing. Look forward to hearing from you if possible. Thanks for queries, apologies for not getting back to you sooner. We will repeat the course later in the year.